Meet your neighbor Sue Rothzen of rural Media. Sue is employed as a full time floral designer at Enchanted Florist in Macomb. She was born in Burlington, Iowa, and raised in Lomax. In 1977, Sue graduated from Dallas City High School and furthered her education by attending Southeastern Community College in West Burlington, Iowa. She and hubby Ron have been married for 26 years. Ron is a farmer/millwright. Besides farming he is employed by Millwright Services in Fort Madison, Iowa. They have two sons, Ron (24) who lives in Raritan and Colin (15) a freshman at West Central High School. A daughter, Kayla (20) is a sophomore at McKendree University in Lebanon, Illinois, on a bowling scholarship. Her parents Lloyd and Iola Martin are deceased. Their family attends Stronghurst Christian Church. 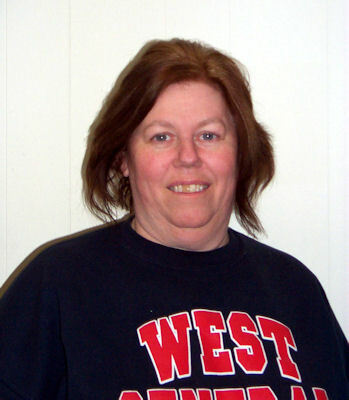 The most recent of Sue's accomplishments is the West Central boys bowling team, where she is head coach, is headed for state. In 2004-2005 when Union and Stronghurst merged and became West Central, Sue started coaching bowling. This year she has three assistant coaches, her hubby, Ron, Sam Bigger and Terry Painter. Sue is a USBC (youth league) certified bowling coach and also certified by the IHSA (high school league). Ron bowls on a Monday night league at Country Fun but Sue said, "I have no time for that!" She said, "Each year our team has went to Sectionals but this is the first year they are going to state". The top two teams in competition go to state from Sectional. The West Central team has never been in the top two until this year. The state meet will be held at St. Clair Bowl in Fairview Heights. They will be bowling on Friday, the 29th and Saturday, the 30th. Friday they bowl 6 games and the top 12 teams return on Saturday and bowl 6 games. The highest total number of points wins state. St. Clair Bowl in Fairview Heights is a special bowling alley for Sue as her daughter, Kayla, also bowls there for McKendree College. There are no Regionals in Illinois but since the sport of bowling has been growing so much there is more interest in having Regionals. Sue said, "There may be a vote on that this year". The boys team has 19 members and 8 will be heading to St. Clair the end of this week to compete. The boys schedules begin in November and finish the end of January. Sue also coaches the girls bowling team of which there are 12 girls participating. The girls schedule runs from the second week in November to the second week in February. Their children, Kayla and Brandon started bowling, at Country Fun, when they were 5 years of age and Colin started when he was 4. They are a bowling family!! In Sue's spare time of which she has little, she raises Australian cattle dogs. They have sold their dogs to folks in Toronto, Canada, Spearfish, South Dakota, Arizona, Florida, New York and many other states. Sue said, "In the summertime, for enjoyment, Brandon races so we go to the races on Friday nights in Donnellson, Iowa, and on Saturday night at 34 Raceways in West Burlington, Iowa.